The chambers of the California Senate, which passed historic changes to the state’s groundwater laws. Click image to enlarge. 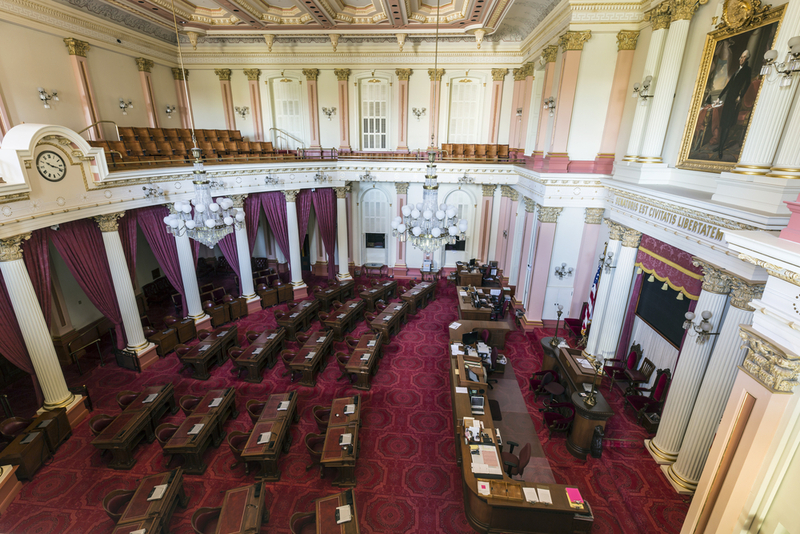 After clearing the first of two legislative chambers, groundwater reform is one step closer in California. By a vote of 26 to 11, the state Senate passed AB 1739, a bill that will require areas that use the most groundwater and have the largest populations to submit plans for managing the resource and to set goals for balancing groundwater supply and demand. The Assembly is expected to vote on the bill on Thursday, as well as on a companion bill sponsored in the Senate. A severe drought, now in its third year, has revealed deep geological and social calamities resulting from unchecked use of groundwater. As more and more water is pumped from the ground, the land surface in the Central Valley, the state’s agricultural hub, is deforming, impairing the ability of canal systems to deliver water to cities and farms. In Tulare County, also in the Central Valley, hundreds of families are without running water after their shallow wells dried up. The Senate vote largely followed party lines, with a few regional defections. Urban officials and urban water utilities lined up in favor of the bill in droves this week. The only two Republicans voting with the Democratic majority both represent districts around San Diego, whose water wholesaler endorsed the measure. The bill faced opposition from agricultural interests in the Central Valley . Along with passage of a water bond, stricter oversight of the state’s groundwater reserves, which account for more than 60 percent of state water use this year, was a top legislative goal this year for Governor Jerry Brown. The Legislature passed a $US 7.5 billion water bond on August 13. Approval from the Legislature and the governor is but a first step in the path to reform. The bill requires the Department of Water Resources to develop by June 1, 2016 rules for evaluating the groundwater management plans that local agencies must produce. Only one-quarter of the state’s 515 groundwater basins are covered under the rules. These are the basins where groundwater use is highest and the population is largest. These basins have until June 30, 2017 to form a management agency and until January 31, 2020 to submit a management plan to the state. The plans will have a broad effect. Counties must consult them before making changes to land development plans. The groundwater management agencies will have the power to collect fees from water users that will pay for projects that put water back into depleted basins. It took 40 years for California to finally agree to manage groundwater. Hopefully things go as well there, as they did in Australia, and we see farmers using water saving techniques, and local water boards directing agricultural decisions based on water use. Oh yes, all the farm land I drive by everyday throughout Fresno County, I witness rampant waste. Well, that was sarcastic. If its anyone that knows how to conserve their resources it is farmers. I see this as another revenue stream and an assault on private property rights. With the history of California’s Water Boards inability to understanding the complexity of groundwater management, coupled with it’s propensity to regulate through permits and fines, we have a recipe for a major hit to our food supply and the costs to produce it. The bottom line is that something has to give. Smarter growing methods (wireless tensiometers systems), awareness and planning are critical, however, most would agree that more government oversight is unlikely to be helpful. Although pushing communities to be responsible makes sense, allowing groundwater to fall into the catagory of the Public Trust Doctrine will be disastrous for ag (recent Sacramento trial court decsion limiting groundwater use to protect riparian species). I don’t see anything in the legislation to inhibit this kind of “taking” of groundwater and giving it to others. Water, food, species, take your pick!! !